The new trailer for Warner Bros. Pictures’ and Legendary Pictures’ “The Dark Knight Rises” smashed the record for most combined downloads through the iTunes Movie Trailers site and the iTunes Trailers iOS app for iPhone, iPad and iPod touch. The trailer went online Dec. 19 at 10 a.m. and was viewed more than 12.5 million times in its first 24 hours, breaking the previous record by well over two million. The trailer can be viewed in HD at http://trailers.apple.com/trailers/wb/thedarkknightrises. Opening on July 20, 2012, “The Dark Knight Rises” is the conclusion to Christopher Nolan’s Batman trilogy. The film’s international all-star cast is led by Oscar® winner Christian Bale (“The Fighter”) in the dual role of Bruce Wayne/Batman. The film also stars Anne Hathaway, as Selina Kyle; Tom Hardy, as Bane; Oscar® winner Marion Cotillard (“La Vie en Rose”), as Miranda Tate; and Joseph Gordon-Levitt, as John Blake. Reprising their roles from both “Batman Begins” and “The Dark Knight,” Oscar® winner Michael Caine (“The Cider House Rules”) plays Alfred; Gary Oldman is Commissioner Gordon; and Oscar® winner Morgan Freeman (“Million Dollar Baby”) plays Lucius Fox. 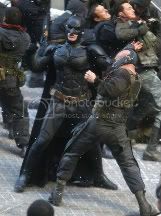 Tags: "Batman", "The Dark Knight Rises", Christopher Nolan, DC Comics, Warner Bros.